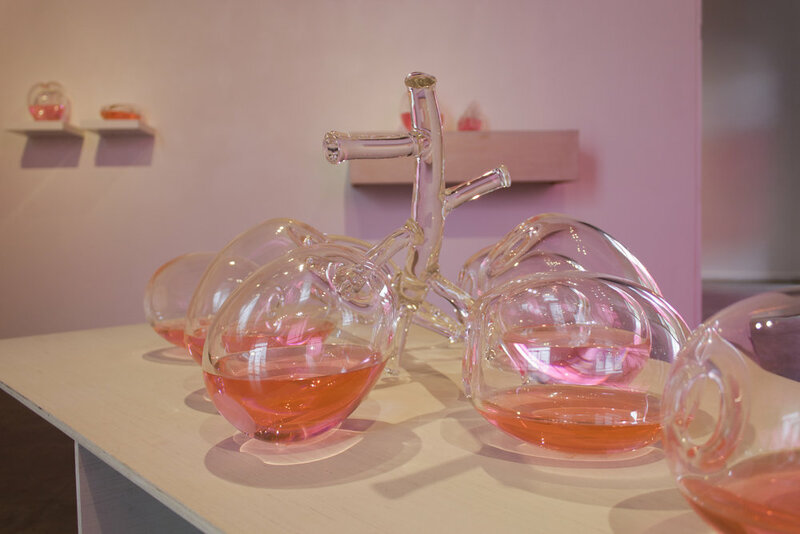 Tutti Frutti, the first solo exhibition at Galleri Urbane by Liss LaFleur, is an immersive multi-media installation anchored by blown glass objects and a new film. 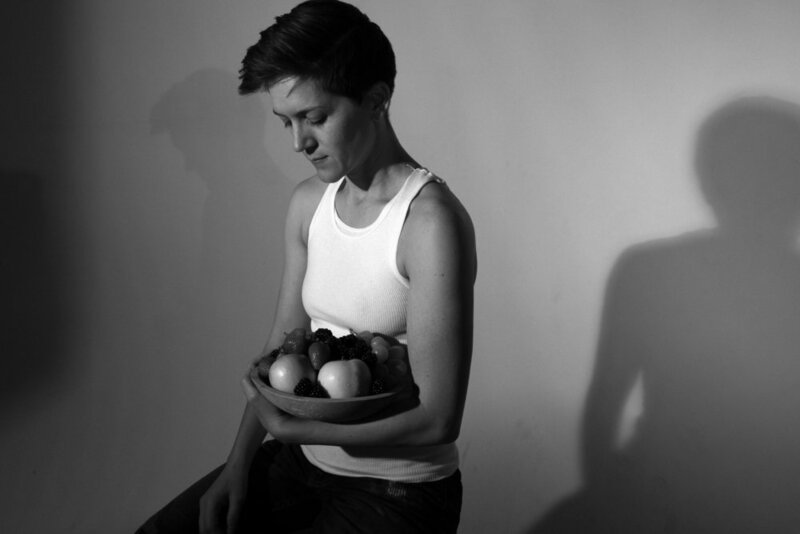 Inspired by Susan Sontag’s 1964 essay “Notes on ‘Camp’,” and the “fruit machine,” a military device used by the U.S. and Canadian government during the Cold War to detect and purge LGBT individuals, this exhibition examines the semiotics of fruit in relation to the queer body. 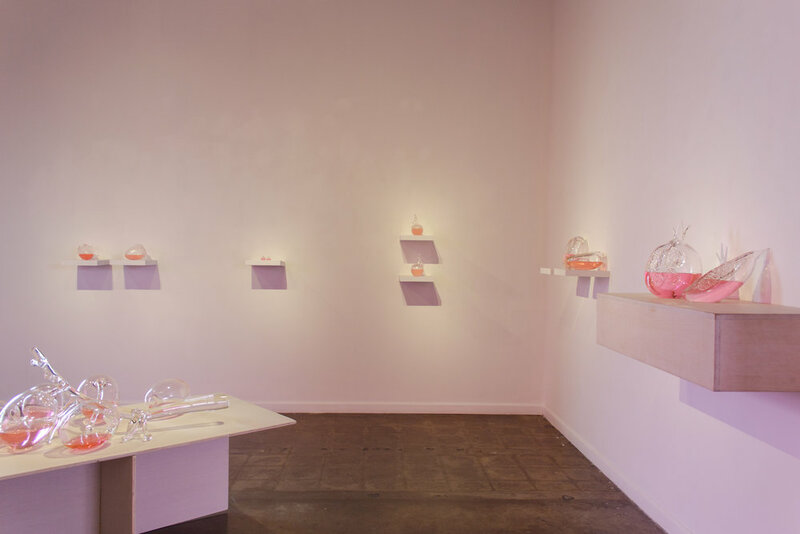 The core of the exhibition is comprised of 22 blown glass fruits. Created during an artist residency at the Museum of Glass in Tacoma, WA, these exaggerated glass fruits are scaled proportionally to bodily measurements of the artist and her mother. A glass banana the length of LaFleur’s leg, apples the size of her fists, and an impressive grape stem in the proportion of the her spine (complete with head-sized grapes) were borne through research on the historical use of fruit to feminize, criminalize, and sexualize the body. The rose-colored water in each hollow glass object beckons to special window treatments that filter the room’s light in the same hue and alter the viewer’s experience of the space. Equally significant to the exhibition is a new single channel video, Boi with A Fruit Basket (2018). The film addresses what Dr. Frank Robert Wake coined in the 1950s as the “Fruit Machine,” a series of pupillary response tests, sweat tests, and word associations used to eliminate all gay men from the Canadian civil service. Electric cello accompanies text read directly from Dr. Wake’s report on the “Fruit Machine” on how to “find and purge” homosexuals. Recalling anthropological films used to record, replay and dissect the mechanics of bodily communication, the video takes Dr. Wake as an unlikely interlocutor for exploring contemporary queer female subjectivity. LaFleur also confronts Dr. Wake’s conspiracies through a series of laminated vinyl prints, each referencing “definitive homosexual meaning,” as written by Dr. Wake. With words like “Bull,” “Coo” and “Cruise,” many of these are double entendre, suggesting socially awkward or sexually suggestive associations. Reclaiming what Sontag describes as “a love of the unnatural: of artifice and exaggeration -- something of a private code, and a badge of identity,” the work in Tutti Frutti collectively examines representations of queerness and its relationship to narrative, vernacular, feminist thought, and radical traditions.